Keeping our body in shape is not all fun and games. It requires discipline and continuous, regular training in order to be truly effective. To have such discipline requires motivation, which is why we often choose to bring a friend to the gym or listen to music while we run or sign up for fitness classes that encourage us to keep coming back. We do these things to make exercise more fun. The same principles apply to brain training: To benefit from it, we must exercise regularly and for that reason, we must have fun while training in order to stay motivated. This observation can be explained through human biology. Studies have shown that short-term goals release quick bursts of dopamine, the brain’s motivational ‘reward drug’, which makes motivation for short-term goals easy. In contrast, long-term goals cause the brain to gradually release slowly increasing amounts of dopamine as we get nearer to the goal. However, this also means that very little dopamine is released in the beginning of a long-term goal, which is why it seems so hard for us to actually get started on a long-term goal. For this reason, we can benefit significantly from an alternative source of dopamine, for example by having fun during the training, so that we can continue on towards the greater goal. Of course, the ability to have fun depends in part on us, the people who exercise, but it also very much depends on how the brain training is presented and on how much fun it provides – and this is where the brain training game comes in. 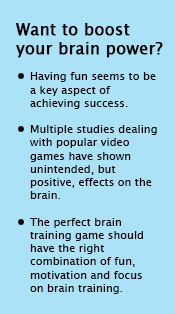 As you will learn in the coming paragraphs, games are much more beneficial for the brain than they may initially seem. In the past, video games were dismissed as mind-numbing pastimes with no inherent purpose other than to act as fun distractions from the real world. It is only recently that scientists have begun to research the potential value of playing fun video games. Daphne Bavelier, a renowned brain scientist from the University of Geneva, released a TED Talk last year in which she explains the brain training effect of playing fun, popular video games, such as the Call of Duty series, and urges parents to compare video games to Sudoku puzzles or other forms of fun and intelligent brain exercise rather than unintelligent waste of time. Bavelier supports her point about the value of fun video games by presenting a series of experiments in which gamers fare better than non-gamers. In a standard eyesight test where the subject is presented with rows of letters in decreasing sizes, the gamers in her study were able to read letters that were two sizes smaller than what non-gamers could see, thus diminishing the myth that screen time deteriorates eyesight. In a test of attention, where the subjects in Bavelier’s study had to follow moving dots on a screen and point them out individually after they had been shuffled, gamers’ brains were able to keep track of six to seven dots at once, while non-gamers were limited to three or four. More and more studies emerge that support Bavelier’s presentation of blockbuster video games inadvertently functioning as fun brain trainers. In August this year, scientists from Queen Mary University of London found that people who played StarCraft were better at strategic thinking and problem solving than people who played an equal amount of The Sims. Back in January, Scientific American reported on how a decade of research had shown that playing Call of Duty improves the brain’s attention and ability to make decisions. Just a few weeks ago, a highly anticipated study published in Nature even showed that 80-year-olds could reach the multitasking brain power of a 20-year-old just by training with a fun brain training game tailored for the purpose. There is no doubt, then, that video games do have some positive effect on the brain. However, it still remains to be seen how much of an effect can be achieved, if motivation through fun and brain training is combined in a perfectly tailored brain training program. This is the conclusion with which Daphne Bavelier ends her TED Talk, encouraging game developers and brain scientists to team up in order to create fun, immersive games designed specifically for brain training. This idea largely reflects the art of creating a fun brain training video game. Such games have to consist of the perfect balance between fun and discipline. They must be entertaining so that they motivate you to keep training – otherwise the brain training won’t be effective – but at the same time they have to actually train your brain and not just be fleeting, colourful pastimes. As when training any other part of the body, training your brain for two minutes a day won’t have any useful effect – nor will training it for an entire day every fortnight. The training must be regular and balanced, not sporadic, and it has to feel fun and motivational, not forced. In addition to all this, brain training games have to constantly challenge your brain. In the StarCraft study mentioned earlier, people who played the fast-paced action game saw a much larger improvement than the ones who played the casual Sims game. Although both games are fun in their own way, only one will actually challenge your brain and thereby improve it. For this reason, the perfect brain training game will have a self-regulating difficulty parameter which is able to adjust itself according to the performance of the player. Once again, the player will need to play the game regularly and for an extended period of time before the difficulty will have been adjusted and especially before benefits can be seen from playing. That is why it is so important that the game is actually fun to play. In the StarCraft experiment, for example, participants played the video game for forty hours over the course of six to eight weeks equivalent to a minimum average of forty minutes per day. Current scientific studies are still busy discovering how to achieve brain training effects. As such, we still don’t know what amount of brain training is required, as a minimum, to achieve the wanted effects. Bavelier’s idea of scientists and game developers cooperating on making fun brain training games is one that deserves to be realised. Brain training apps often consist of a series of quick tasks where each area of the brain is trained for just a few minutes. This is possibly to avoid that the game repeats itself and stops being fun, but the problem is that the effect of the training will be comparable to doing one push-up a day. The fact of the matter is that lengthier, adapting challenges can be a just as fun solution and will likely be much more effective. At Brain+, we base our development on Bavelier’s philosophy. Creating a brain training game with just the right combination of challenge and fun is difficult, but it can definitely be done. By creating immersive games with dynamic feedback and fun gameplay, we hope to help you stay motivated in your brain training so that you can reach your full potential. Taking care of your brain does not have to be boring. In fact, it has to be fun. After all, staying sharp and having fun is what life is all about.